We’d love your help. Let us know what’s wrong with this preview of Selected Stories by O. Henry. O. Henry originated the humorous, energetic tale that ends with an ironic, even shocking twist. In "After Twenty Years," for example, two boys agree to meet at a particular spot exactly twenty years later. Both are faithful, but in the intervening years one boy has turned into a criminal, the other into a policeman. Behind the rendezvous lurks a powerful dramatic situation O. Henry originated the humorous, energetic tale that ends with an ironic, even shocking twist. In "After Twenty Years," for example, two boys agree to meet at a particular spot exactly twenty years later. Both are faithful, but in the intervening years one boy has turned into a criminal, the other into a policeman. Behind the rendezvous lurks a powerful dramatic situation with a fascinating moral dilemma--all in a few brief pages. To ask other readers questions about Selected Stories, please sign up. i want to read some o henry book? In high school I read "The Last Leaf". It was brilliant and simplistic. Many years later I decided I wanted to read more of O. Henry's work and Barnes and Noble provided the fodder. "Selected Stories of O. Henry" is a sort of Best Of collection of 45 short stories by O. Henry. The tip of the ice berg compared to his tiresome output over a short period of time. O. Henry is considered by many to be the greatest American short story writer. This cross section of his work shows why. He is able to wea In high school I read "The Last Leaf". It was brilliant and simplistic. Many years later I decided I wanted to read more of O. Henry's work and Barnes and Noble provided the fodder. 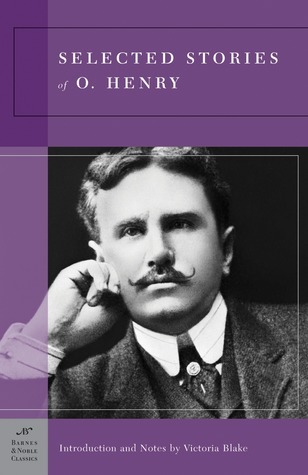 "Selected Stories of O. Henry" is a sort of Best Of collection of 45 short stories by O. Henry. The tip of the ice berg compared to his tiresome output over a short period of time. O. Henry is considered by many to be the greatest American short story writer. This cross section of his work shows why. He is able to wear many shoes of American society in his time. From city life to country living, living rich and scraping by poor, O. Henry is able to realistically provide a point of view from all angles. Coupled with the ability to keep a story short, to the point AND entirely entertaining. To read this is to read the manuel on story telling. I did try to read this book straight through at first. I only accomplised about half of the book this way. Though O. Henry is exellent reading, he can also become repetative story after story. I broke up reading the last half of the stories by reading a few between reading other full lenth novels. It helped the material go down easier. It’s hard to believe that O.Henry died penniless. Perhaps his facility to peer inside an individual’s soul took its toll. He wrote of people from all walks of life and his egalitarian position was that everyone deserved to be written about. Every human being possessed vitriol, pathos, and humor. His ability to define character via humor is a revelation that will never pale beside more current work and it is what continues to resonate once a story is complete. “Jeff Peters has been engaged in as many schemes for making money as there are recipes for cooking rice in Charleston, D.C.” (290). This is the opening sentence from Jeff Peters as a Personal Magnet and it is all I really need to know about this character. I’m prepared for a schemer, a dreamer, and someone who will probably lift my wallet if I’m not careful. By switching to first person narration, O.Henry allows Jeff Peters to tell his tale: “Fake? No sir. There was two dollars’ worth of fluid extract of cinchona and a dime’s worth of aniline in that half-gross of bitters. I’ve gone through towns years afterwards and had folks ask for’ em again” (291). The character’s earnest admission that his “Resurrection Bitters” (293) are the real deal simply adds to the comedic deception. It is a time when snake oil salesman frequented rural towns in dilapidated trucks and promised miracle cures. O.Henry bore witness to this cultural landscape and captures perfectly the tone of desperation, deception, and need. Television commercials today provide much the same misinformation. But O.Henry’s hilarious tale of duped townspeople is not just a funny anecdote. It gives voice to real fears and reminds us that the world is filled with charlatans as well as those desperate to be swindled. Slightly different is The Skylight Room. We are presented with the matron of a boarding house – Mrs. Parker – who considers all her potential boarders with contempt. “If you survived Mrs. Parker’s scorn, you were taken to look at Mr. Skidder’s large hall room on the third floor. Mr. Skidder’s room was not vacant. He wrote plays and smoked cigarettes in it all day long. But every room-hunter was made to visit his room to admire the lambrequins. After each visit Mr. Skidder, from the fright caused by possible eviction, would pay something on his rent” (67). We are now aware that no roomer is good enough for Mrs. Parker’s parlors. Plus, one of her boarders is an idler – a writer no less – who has fallen on hard times. Or perhaps, his times have never been very good. The young woman seeking a room – Miss Leeson – ends up in the dreaded skylight room. “Miss Leeson was not intended for the skylight room when the plans were drawn for her creation” (69). The room occupies the least coveted position in the house – the attic. A person’s residence in the skylight room summarily announces their poverty. From beyond the lone light source in the ceiling of her attic room, Miss Leeson identifies the North Star – which she names Billy Jackson. It is her constant companion and the one shard of light she has - literally and figuratively. Unable to find work and running out of money for food, Miss Leeson expires on her bed – or so we are led to believe. In a beautiful serendipitous conclusion, the doctor who saves her life is named, “Dr. William Jackson”. When this bittersweet story begins, we have no idea that humor will dissolve into gravity. Yet, it all makes perfect sense. O.Henry began by allowing us to see people whose foibles define them and often, we catch a glimpse of ourselves. “She knew no more shorthand than if she had been a graduate in stenography just let slip upon the world by a business college. So not being able to stenog, she could not enter that bright galaxy of office talent. She was a freelance typewriter and canvassed for odd jobs of copying.” (53) In Springtime á La Carte, O.Henry makes clear his disdain for the monotony of office work and the type of mentality it demanded. More importantly, our heroine – a young ambitious working girl – battles for a secure existence. Her drive and determination are rewarded but we never lose sight of how close she is to the brink of ruin – Sarah lives in a room at the back of a house and sees only a brick wall outside her window. O.Henry returns many times to the motif of a resolute population concentrated in an urban center. There is something very Dickensian about O.Henry’s handling of his characters’ predicament. The grimy industrial enclaves echo oppression and disillusionment. Yet, he offers up the mutability of the human condition as proof that transcendence is – sometimes – possible. Tôi đọc hết tuyển tập chuyện hay nhất của O.Henry vào năm lớp 8 sau khi học xong "Chiếc lá cuối cùng". Các chuyện hay nhất mà tôi thấy là "Hai mươi năm sau", "Những món quà của thầy pháp", "Căn phòng có đồ cho thuê sẵn" và "Một cuộc đổi đời". Truyện ngắn gần đây nhất của O Henry mà tôi đọc là hồi lớp 11 (2009) hình như là chuyện về cây xương rồng. Truyện của O Henry thường kết thúc rất bất ngờ tạo cảm giác rất lạ mặc dù nhiều khi nội dung chuyện buồn đến khủng khiếp. Dù viết đầu thế kỷ 20 khi pho Tôi đọc hết tuyển tập chuyện hay nhất của O.Henry vào năm lớp 8 sau khi học xong "Chiếc lá cuối cùng". Các chuyện hay nhất mà tôi thấy là "Hai mươi năm sau", "Những món quà của thầy pháp", "Căn phòng có đồ cho thuê sẵn" và "Một cuộc đổi đời". Even though this book took me forever to read, I really enjoyed it. Everyone is familiar with "The Gift of the Magi," and I had read a couple of his short stories in school, but I had no idea what I was getting myself into when I picked up this volume. I enjoy short stories from time to time, but I usually end up liking some stories more than others. Most of the time, short story collections are "meh" for me. Not so in this case. I can honestly say that I enjoyed each and every story. I was real Even though this book took me forever to read, I really enjoyed it. I was really surprised how much I looked forward to beginning each story. O. Henry writes about average people, and many critics call him "formulaic." Well, he is formulaic, let's face it. All of his stories have some kind of surprise twist at the end. However, in a twist that O. Henry himself would be proud of, this turns out to be one of the strongest features of his stories. Seriously. I would be reading along, and I'd try to be guessing at what was going to happen. But he fooled me just about every single time. He's formulaic, but absolutely unpredictable. It adds suspense to his stories; it makes them more exciting. You know it's coming, but you don't quite know what it is. I love it. O. Henry is a great writer, to boot. I know a lot of people shy away from short stories because they're just not long enough to satisfy most people. Even though the character development isn't the greatest (I will admit), I was completely engrossed in the stories. When he was writing about the busy streets of NYC, I was there. When he was writing about bandits out West, I was there. He writes with just enough descriptive flair to put me where he wants me to be. Not only that, but his characters felt so real. He really understands people and human nature. This even shows in his use of vernacular. There have been many a time when I have felt that an author's attempts at the common vernacular have just seemed off. O. Henry is spot on. I could definitely hear each voice as I was reading. I think one of O. Henry's strongest assets in writing these stories is his use of comedy, which lends itself to the twists. The twists would not work without the comedy. They go to show just how absurd life can be and how coincidence can play such a part in an average person's life. I can't say that O. Henry is the most hilarious author I've read, but there were times when I definitely laughed out loud. Life, and especially love, are funny in the way that they work out, and O. Henry uses this to make his tales entertaining. I also want to point out that this particular edition is pretty good, and I applaud Barnes & Noble (or whoever put this together). There are a great variety of his stories from throughout his writing career. There is an informative introduction which lends insight into O. Henry and why he wrote the way he did. There was even a great section at the end that included reviews of O. Henry over time and some questions to ponder. I only have two complaints about this edition. First, it seemed that the editors clumped similar stories together, i.e. all the NYC stories, all the Western stories, all the robber/thief stories, etc. It made it a little redundant at times. My last complaint is more of a personal thing. I hate endnotes. I hate having to flip back to the end of the book to see what little blurb I have to read. I mean, there were footnotes throughout as well, so I feel like it just would have been nicer to have one or the other. But that's just me being picky. O. Henry is famous for his surprise endings (which i guess makes them a little less surprising) as well as his light humor. while that makes for entertaining reading, i wouldn't call it frivolous. more gentle than his contemporary Mark Twain, but with greater realism, his stories deal with various classes of New York society, sometimes in the same story, and always make me think or feel something i didn't expect to. O. Henry is a great delight. He transported me to his world of joy and wonderful surprises. "The Last Leaf," "The Gift of the Magi," "The Ransom of the Red Chief," and "A Retrieved Reformation" are his best short stories. I love this author with his fabulous short stories! The story of Della and Jim, a married couple struggling to make ends meet. Each sells his most valuable belonging to buy a Christmas present for the other. Della sells her beautiful long brown hair for twenty dollars, and Jim sells his watch, which has been in his family for three generations. Each buys a present intended to enhance the beauty of the other’s most valued possession: Della buys Jim a beautiful fob for his watch, and Jim buys Della a pair of jeweled tortoise-shell combs—but they do so with the money they make from selling their most prized possessions. The result is a comic, and heartwarming, predicament in which each possesses an accessory that’s designed to highlight the beauty of their recently sold greatest treasures without having those treasures themselves. Despite the irony of their exchange, Jim and Della prove their love for one another by sacrificing their dearest possession for the sake of anther. The story of Soapy, a homeless man living in New York city just before the onset of winter. Soapy is too proud to take up residence under the wing of the local charitable institutions and wishes to spend three harshest months of winter in the cozy warmth of a prison cell. He tries to get himself arrested several times, harassing a woman, eating at a restaurant without paying his bill, stealing a man’s umbrella, disturbing the public peace, breaking a shop window with a stone—but each attempt at self-incarceration concludes with an ironic twist: the woman he harasses turns out to be a prostitute; the restaurant owners merely kick him out; the umbrella he steals appears to have been stolen by the man whom Soapy steals it from, so that the former allows Soapy to take it; the cop who witnesses Soapy’s ruckus mistakes him for a Yalie “celebratin’ the goose egg they give to the Hartford College”; and the police refuses to believe that unruffled Soapy broke the shop window. The final irony comes at the end of the story, when Soapy overhears the titular anthem being played in a church—an anthem that he recognizes and associates with his younger days of family happiness and innocence. The anthem spurs a moral conversion in him, inspiring him to quit his life of voluntary vagrancy and get a proper job. Yet, at the moment he resolves to lead a better life, he is stopped by a cop for loitering, after which he is sentenced to three months in prison. A hilarious little story—and a possible critique of the inefficacy of New York City law enforcement at the turn of the century. Major Talbot and his daughter Lydia, natives of Alabama, move into a respectable, if humble, Washington boarding house. Major Talbot embodies the aristocratic values of the “old, old South.” He spends most of his time reminiscing about the old regime and writing a memoir about his life in the antebellum South—a memoir inflected by the old-fashioned prejudices of his times. Nearly seventy, he is entirely out of touch with the modern world, which he finds incredibly vulgar—a figure of the dispossessed Southerner too proud to acknowledge his fall from power after the war and without money. His daughter Lydia informs him that soon they will run out of money and be unable to pay the following month’s rent. Also living in their Washington boarding house is a vaudeville actor by the name of Henry Hopkins Hargraves. Hargraves is fascinated by Major’s Talbot’s quaint manners and anecdotes, and the two strikes up an unlikely friendship, in which Hargraves listens to Major Talbot’s recollections at length. Unwilling to face the harsh reality of his pecuniary situation, Major Talbot buys tickets to a war drama for him and his daughter, a play by the name of “A Magnolia Flowers.” There they are stunned to find Hargraves impersonating Major Talbot’s mannerisms in the role of a Colonel Calhoun. Talbot is infuriated, though his daughter can’t help but laughing during the performance. The following day, when Hargraves goes to visit Talbot for their daily talk, the latter scolds the actor for his impertinence and dragging him “through the slanderous mire of a corrupt stage.” Hargraves says that he meant no offense and offers the Major several hundred dollars for helping him to develop his role as Colonel Calhoun. Talbot refuses and dismisses Hargraves. It’s after this that Hargraves resorts to his eponymous “duplicity,” when he pretends to be an old black servant of the Talbot family—one who had borrowed some colts many years ago and agreed to repay him for them in the future if possible. Immensely moved, Talbot accepts three hundred dollars from Hargraves—disguised in blackface as “Uncle Mose.” Hargraves becomes immensely successful in New York City’s theater scene for his performances in “A Magnolia Calhoun.” He writes Lydia a note in which he tells her of his success—and, in the story’s twist ending, reveals that it was he, as Uncle Mose, who gave the Talbots the money they needed to pay their bills. Lydia, of course, keeps Hargraves stunt a secret from the Talbot, who continues living in the past. Another charming story with the inevitable twist ending—and a gentle satire on the elderly and dispossessed antebellum aristocrat at the turn of the century. The narrator and his accomplice Bill are two conmen, who need two thousand dollars in order to pull of “a fraudulent town-lot scheme in Western Illinois.” The story is set in a small Alabama town, where the narrator and Bill plan to hold the red-headed ten-year-old son of one of the city’s most prominent citizens (the mortgage fancier Ebenezer Dorset) for ransom. The Dorset kid, Johnny, is incredibly rambunctious and hyper. When the narrator and Bill take him to a mountainside cave, they begin to regret their decision. He chatters endlessly and repeatedly tried to make the narrator and Bill play with him. He adopts the persona of the eponymous Red Chief and annoys the hell out of both men, frequently injuring Bill. The narrator drafts a ransom note for fifteen hundred dollars—five hundred less than the originally intended two thousand, after Bill tells the narrator that no one in their right mind would pay two thousand dollars to take Johnny in. They send the ransom note to Mr. Dorset and—here’s the inevitable twist— sends back a counter-ransom note, in which he agrees to take his son back if they pay him two hundred and fifty dollars. Irritated beyond measure and nearly losing their sanity, they take Johnny back to his father’s house and pay the ransom of two hundred fifty dollars. The classic story of dim-witted crooks beaten by the incorrigibly mischievous youngster, a story with origins in the picaresque. This is the story of three artists living in the Greenwich village art distract during a time of rampant pneumonia—two female friends, Sue and Joanna, sharing an apartment; and an old Dutch painter, Mr. Behrman, who live on the ground floor beneath them. Sue and Joanna decided to share an apartment after discovering their mutual interest in art, and Mr. Behrman is an alcoholic and failed painter who despite decades of painting has never manages to produce the masterpiece he dreams of making. Joanna contracts pneumonia toward the beginning of the story and gets this idea that she will die when the last leaf on a vine on the brick building outside of her bedroom window falls. She counts the falling leaves, one by one. Sue begins to worry for Joanna, especially after the doctor (a comic figure) warns her that she only has a small chance left to live, begin determined to die. One day Sue invites Mr. Behrman upstairs to paint him as a hermit-miner and tells him about Joanna. Mr. Behrman criticizes the silliness of Joanna’s conviction that she will die with the last leaf. The following day, after a terrible storm, a single leaf still appears to be on the vine outside Joanna’s window. This boosts Joanna’s morale, and the invalid interprets this as a sign that she is meant to get well again. Joanna regains hope in life and hopes to paint the Bay of Naples one day. Soon after, it is discovered that Mr. Behrman dies of pneumonia. Sue realizes that (and here’s the inevitable twist) he painted the last leaf on the vine and tells Joanna: “Didn’t you wonder why it never fluttered or moved when the wind blew? Ah, darling. It’s Berhman’s masterpiece—he painted it the night that the last leaf fell.” A heartwarming story about how an act of kindness can be one of the most meaningful expressions of personal creativity. Set in the Vallambrosa apartment house, this is the story of three people brought together by what initially appears to be their shared poverty. At the beginning of the story, Hetty Pepper is fired from her department store job for failing to objecting to being sexually harassed by her boss. She goes home and prepares to make a beef stew, but finds that she has neither potatoes or onions. A girl in the hallway, a struggling artist named Cecilia, happens to have some potatoes, and Pepper invites her over, suggesting that she contribute her potatoes to the soup. Still a crucial third ingredient, the obligatory inion, is lacking. At Pepper’s apartment, Cecilia beings crying and tells Pepper of how she tried drowning herself by jumping off of a ferry but was ultimately saved by a man. Pepper walks out into the hallway where she sees a man with an onion. She asks him to contribute his inion to the soup and join them for dinner. He enters and—surprise, surprise—he turns out to be the man who rescued Cecilia from drowning on the ferry. The narrator relates the story of Jeff Peters and Andy Tucker, two men who swindle a Pittsburg millionaire out of two thousand five hundred dollars. Jeff is generally honest, and doesn’t like taking things from others unless he has something to give them back. Andy, we learn, has “too much imagination to be honest.” The two toil in the business of making headache powder and roach destroyer. One day Andy decides that he and Jeff should defraud a Pittsburg Millionaire. The men journey to Pittsburg, where Andy meets Scudder, a parvenu who made a fortune in oil and is trying to move up in society by cultivating his appreciation for art and literature. Scudder befriends Andy, and the former shows him a two-thousand-year-old Egyptian ivory carving, a lotus flower with a woman’s face carved into it. It was one of two that an ancient Egyptian carver made for Ramses II. Andy tells Jeff that he found the other in a pawn shop, and asks Jeff to impersonate an art professor and sell him the matching carving for a high price. Jeff agrees, and Scudder buys the carving for two thousand dollars from the supposed art professor. After the sell, Andy tells Jeff that they need to leave town quickly. He reveals that the carving Jeff stole was one and the same with Scudder’s carving, which Andy stole when Scudder was showing him his collections. The twist here is that the man who hoodwinked Scudder out of his money was himself hoodwinked into doing so—“out of respect for that conscience of yours.” A comic story of ethical scrupulosity (and its absence)—and a parody of American new money desperate for cultural capital. This story introduces the infamous Cisco Kid, the eponymous caballero, in the American mythology of the Wild West. The Cisco Kid—named Goodall, apparently—kills men for whatever reason he thinks fit. He kills Mexicans “to see them kick.” He is the overlord of the arid borderland between Texas and Mexico. We are told in the beginning of his half-Mexican girlfriend, Tonia Perez—who’s described as part Madonna, part Carmen, part hummingbird. In an attempt to catch the Cisco Kid and put an end to his murderous rampages, Lieutenant Sandridge consults his girlfriend Tonia, asking her questions about the infamous Cisco Kid. Tonia and the lieutenant strike up an amour, and the former asks the lieutenant to surround the camp when the Kid comes so they can kill him. She herself is frightened of the Kid and wants him dead. The lieutenant agrees and leaves, not knowing that Cisco, who had been hiding behind some trees, overheard their entire conversation. When the Kid finally returns back to his girlfriend, he pretends that he didn’t hear anything and embraces Tonia as usual. But he soon implements a vengeful plot: he sends a note to the lieutenant pretending to be Tonia, in which Kid-as-Tonia warns the lieutenant that the Kid is growing suspicious of a plot against him and will test her loyalty by having them switch clothes the following morning to see if she was planning to have him killed. The lieutenant rides over the next morning and shoots the figure clad in Tonia’s clothes, who he assumes to be the Kid. Later he soon discovers his error, when he is informed that the forged letter was written by the Kid himself. But by this point the Kid has ridden coolly off into the distance, whistling with a kind of mythic nonchalance. The title of this story comes from Shakespeare’s Troilus and Cressida: “One touch of nature makes the whole world kin.” The idea being that, despite all our differences, when our common humanity if foregrounded our shared human nature brings us all together. O. Henry offers a comic illustration of this theme. Here’s the story of a burglar who befriends the man he initially intends to steal from after learning that the latter, like him, suffers from a bad case of rheumatoid arthritis. After finding him in his bed, the burglar asks his victim to lift up his hands, but the latter can only life one of them up, due to his arthritis. In a moment of absurd comedy, the burglar realizes that his unoccupied hand (he has a gun in the other) is also burdened with arthritis and won’t move so he can steal the things on the victim’s table. The two get into a lengthy exchange comparing the different remedies they’ve used to try to cure their incorrigible rheumatism. The story finishes with (and here’s the quintessential plot twist) the burglar inviting the victim out for a drink, on him. When reading a short story collection, especially a collection by only one author, I always face the problem of fatigue. Of being "authored - out". Becoming so familiar with the writer's style that the stories blur together and it gets. . . yeah, maybe a little boring and a bit of a chore to finish. There were times that I did feel that when reading this collection. When, I suppose, the O.Henry "twist" became O. Henry "rote" and I had to step away a read something else but. . . more often then th When reading a short story collection, especially a collection by only one author, I always face the problem of fatigue. Of being "authored - out". Becoming so familiar with the writer's style that the stories blur together and it gets. . . yeah, maybe a little boring and a bit of a chore to finish. There were times that I did feel that when reading this collection. When, I suppose, the O.Henry "twist" became O. Henry "rote" and I had to step away a read something else but. . . more often then that were the times when I just had to read one more, and one more, and one more, and once more till real life intervened. It's the twist that gets you. Really. That makes these stories and the O. Henry style memorable and distinct. It always starts out as some "slice of life" thing that you would thing almost anyone could describe or claim to have seen as they went about their ordinary day then. . . twist. . . something happens that just makes things not so ordinary and just. . . more. . . more memorable, more distinct, more ironic, more heart warming or heart wrenching. Just. . . more. And of course his eye for detail and ear for dialogue really paint a picture and draw you in. O. Henry was a new writer to me. I picked this up because it was one on the few English books in the library at the Chinese University where I work. Some of the short stories are better than others. I liked the way he used adjectives although sometimes it seemed overdone and I also enjoyed how he'd sometimes comment on both written and spoken cliches, which are still cliches in today's world. O.Henry's stories always had a twist however sometimes it was easy to guess how he'd end the story. I searched by ibn but this isn't the edition I have. We'll see how many of these I have time to read before it must be returned. Some of these are excellent, others less so. There were times that the description of even a minor character ran on to such an extent that I lost track of the finer points being set up in the plot. I seem to adore O. Henry, though the stories that are set in the West do seem to be a bit thin and are constantly repeating the same plots....but! I do love the allusions, the language, and the "surprise" endings. The version I read was 401 pages long. This book at the end of every short story I wanted to read an entire book to see what the characters did after the story ended. Very good book. My favorite story was The Last Leaf. Henry never fails to catch you with his trick ending. But this master of the short story may have also contributed to its evolution away from the formulaic trick ending to today's slice of life, open-ended, much ados about nothing stories. Before Roald Dahl and Sudha Murthy and R K Narayan, O Henry was my favorite author of short stories! 'The Last Leaf' 'After 20 years' 'The Count and the Wedding Guest' are a few of my favorites.! There are some really funny, sad, inspiring, and weird stories in here. I love O. Henry's style. He is great! "მსოფლიოს რჩეულ მოთხრობებში" ხომ დაიბეჭდა და აქ უფრო მეტია და ბევრი. თან სხვა თარგმანია. განსაკუთრებუად მომეწონა "წითელკანიანთა ბელადის გამოსყიდვა" და "მოგვების ძღვენი"
This review has been hidden because it contains spoilers. To view it, click here. Học Chiếc lá cuối cùng từ lâu lắc rồi, những kiến thức cô dạy, những phân tích về câu chuyện cũng chẳng còn nhớ. Thế mà đọc tập truyện ngắn của ông lại trầm trồ: "Có quá nhiều truyện hay và ý nghĩa sao lại không được mang vào chương trình học..."
Truyện của O Henry thiên về slangs nên bản tiếng Việt hầu như không chuyển tải hết được những thâm thuý trong từng câu chữ. Đọc từng truyện đều rất hồi hộp và lo lắng vì kết của ông rất bất ngờ. Giống như đứng giữa ngã ba, câu chuyện đó đều có thể rẽ bấ Học Chiếc lá cuối cùng từ lâu lắc rồi, những kiến thức cô dạy, những phân tích về câu chuyện cũng chẳng còn nhớ. Thế mà đọc tập truyện ngắn của ông lại trầm trồ: "Có quá nhiều truyện hay và ý nghĩa sao lại không được mang vào chương trình học..."
Truyện của O Henry thiên về slangs nên bản tiếng Việt hầu như không chuyển tải hết được những thâm thuý trong từng câu chữ. Đọc từng truyện đều rất hồi hộp và lo lắng vì kết của ông rất bất ngờ. Giống như đứng giữa ngã ba, câu chuyện đó đều có thể rẽ bất kỳ nhánh đường nào để kết thúc. Ấn tượng nhất có lẽ là Đồng bệnh tương thân, Ngôi giáo đường với cối xay nước và Xuân về trên thực đơn. - Đồng bệnh tương thân kể một câu chuyện khá ly kì??? Một tên trộm lẻn vào nhà bỗng dưng gặp một người bạn chí cốt chỉ sau vài phút trò chuyện về căn bệnh của mình. Đọc truyện này mình chỉ thấy sự đời nó rẽ ngang rẽ dọc quá, có khi nào sau này phạm tội lại gặp được tình yêu như mối tình cảnh sát-học sinh nọ không biết. - Ngôi giáo đường với cối xay nước: Câu chuyện làm mình ấn tượng nhất hơn cả sự hi sinh của Behrman, đó là tình cha con máu mủ, là kí ức tươi đẹp của một đứa con gái mà chỉ có bài hát kết tinh của tình yêu mới đánh thức được. Mình suýt bật khóc khi nghe tiếng gọi của cô bé Dums với cha khi nghe bài hát đó. Bài hát ấy phải ấn sâu đến mức nào mới có thể phủi hết đám bụi dày kí ức để động đến sâu thẳm con tim. - Xuân về trên thực đơn: Đến gần cuối thì thấy ông O viết suy nghĩ khá nhiều trong các mẩu chuyện tuy vậy lại làm đặc sắc cho câu chuyện khá nhiều. Đọc cái này chỉ đơn giản là thấy Xuân về rồi, lại bắt đầu một năm mới nữa khi đó phải chăng mình lại có một quãng đường tiếp tục cố gắng đầy thành công. P/s: Bản mình đọc chẳng phải quyển này nhưng không tìm thấy quyển khác trên Goodreads. Mình từng thử đọc bản Tiếng Anh nhưng đọc không nổi, vốn từ và hiểu biết của mình không đủ để hiểu cặn kẽ từng góc cạnh ý nghĩa trong truyện ngắn của O. Henry. May sao kiếm được bản dịch của Ngô Vĩnh Viễn, tuy không đối chiếu bản dịch và bản gốc nên không biết độ chính xác đạt bao nhiêu % nhưng bản này đọc rất xuôi kèm chú giải tường tận, bao gồm cả những chỗ khó dịch và khi tác giả chơi chữ. Ý nghĩa truyện ngắn của O. Henry thì khỏi phải bàn cãi rồi. Đối với một đứa không quá hứng thú với văn h Mình từng thử đọc bản Tiếng Anh nhưng đọc không nổi, vốn từ và hiểu biết của mình không đủ để hiểu cặn kẽ từng góc cạnh ý nghĩa trong truyện ngắn của O. Henry. May sao kiếm được bản dịch của Ngô Vĩnh Viễn, tuy không đối chiếu bản dịch và bản gốc nên không biết độ chính xác đạt bao nhiêu % nhưng bản này đọc rất xuôi kèm chú giải tường tận, bao gồm cả những chỗ khó dịch và khi tác giả chơi chữ. He was born 1862 Greensboro, North Carolina. When he was three years old, his mother died from tuberculosis. He left school at fifteen, worked five years in his uncle's d William Sydney Porter lends the pen name "O. Henry" to surprise endings signed officially as Sydney Porter. His biography shows where he found inspiration for his characters. Their voices and his language were products of his era.